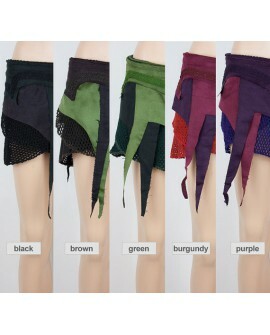 EarthyWear - Festival, psytrance wrap skirt. Wrap around boho mini skirt made of cotton, crochet and velvet. This skirt has a lot of charming details. There is the embroidery detail around the waist of the skirt and the tip of the very practical pocket, as well as the stylish crochet underlay. Then there are the beautiful layers of smooth soft velvet to complete the ensemble. This is a perfect addition to your party wardrobe. One size, adjustable. Lower waist 63.5cm to 106cm (25in to 42in). This skirt will fit you if your size is in between UK 4-18 | AU 4-18 | US 1-14 | EU 32-46.